Homemade window cleaner is one of my favorite DIY cleaning recipes: it’s so cost-effective, and it leaves a wonderfully streak-free shine. You don’t have to limit its use to windows, either! I use it on glass surfaces throughout my home, including the fronts of framed photos and my glass shower doors. Our windows get coated with dirt spots and pollen, but they also acquire a different, more stubborn kind of mess known as city grime. I try to make window cleaning a monthly chore for that reason, at least on the inside. With 36 windows in our house, I need a window cleaner that works quickly, cleans thoroughly and doesn’t cost a small fortune! This homemade window cleaner fits the bill. * “Surgical spirits” in the UK. 1. Combine ingredients in a spray bottle and shake gently to mix. 2. Fold a few sheets of newspaper together like a washcloth, or use a microfiber cloth. 3. Spray the glass then wipe. 4. When cleaning framed photos, spray the cloth rather than the glass. • NOTE that the dish-washing liquid shouldn’t contain moisturizers or “oxygenating action” — you want a straight liquid dish soap like Dawn Original (Sunlight or Fairy in the UK) or even Ivory. • I find using rubbing alcohol cuts through city grime best, but if you’re in a more rural area, you can skip it and just use water. • When cleaning windows, wipe left-to-right on the inside, and top-to-bottom on the outside. That way you can tell which side a smudge is on. • It’s best to clean windows on an overcast, dry day. 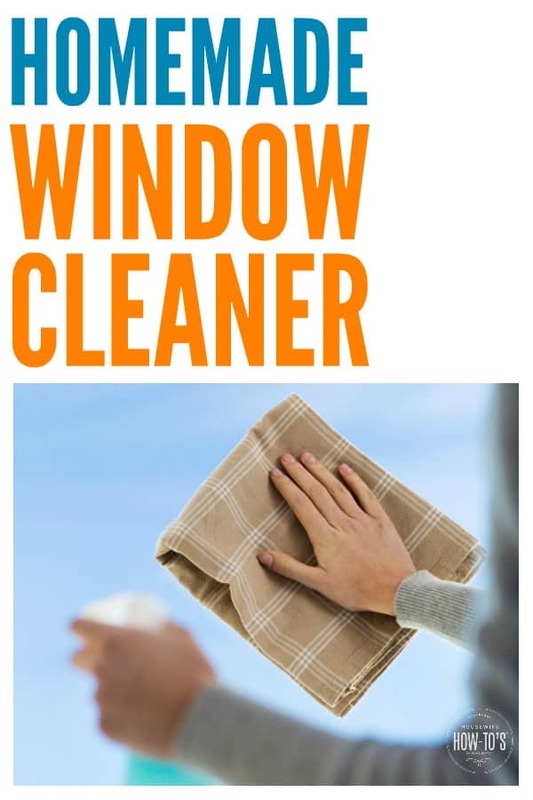 Trying to clean them while the sun is hitting them, or while they’re still hot from being exposed to the sun, will lead to streaks no matter what window cleaner you use. • Crazy as it sounds, I have the best luck cleaning the inside of kitchen windows at night. Turn off outdoor lights and work in a brightly lit kitchen: you’ll see every smudge on your windows, making them easy to clean. I’ve read about that too. I believe it said it works best on outside of windows and bathroom mirrors. Have you ever heard of/used a drop of jet dry in your window cleaning? I saw someone else (sorry, was just browsing the internet!) had a recipe using jet dry. I haven’t tried it, just wondering if you had. I absolutely LOVE microfiber towels! They’re brilliant on windows and, as you pointed out, for dusting. They get computer screens and phones squeaky clean, too. I keep one with my bottle of daily counter spray under the kitchen sink because there’s nothing better to get those counters shiny each morning. The only downside is that they do need to be replaced fairly often, even if you take care of them properly. So now I use the old ones to stuff saggy sofa cushions and doggie pillows. My favourite window cleaner is newspapers – they wipe completely clean and don’t leave any streaks. And they’re super cheap, or free if you have free newspapers in your area.